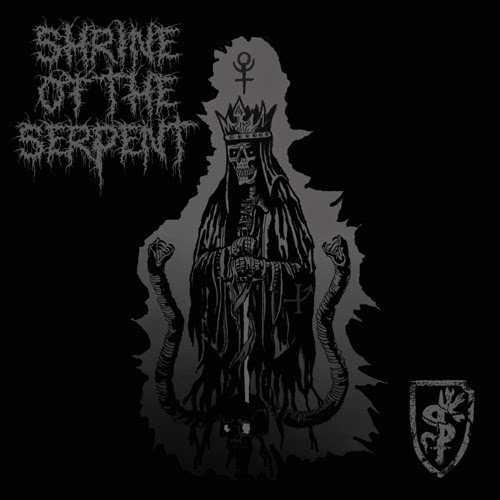 With members from Aldebaran, Roanoke, and Tenspeed Warlock, Shrine of the Serpent has a pretty reputable pedigree to its sludgy & deathly doom, and over the half-hour covered by their three songs on this debut EP, the group lays the metal down with resounding thumps and lyrical style channeled from the tradition-makers of '80s death/doom metal. Blood, bones, and curses are cast upon the listener, with concise slices of melodic indulgence coming from the guitar over the throbbing bass. The vocals are dark and guttural, but not to the point of overwhelming the words, so even in the biggest bridges of pounding drums and growls rising to near-wails, there's a clarity that keeps the essential thrust coming through with no problems. It fits well with the restrained production, which keeps the band's output intimate as they deliver their angry tales of decay. Instead of going for the huge amounts of reverb found in the stonier side of doom metal, their levels are cold and sharp, with the acoustics sounding as though the recording sessions could have taken place in a well-furnished crypt. All three of the tracks feel well fleshed-out; they're long, but in a way that puts that time to work in expanding the main ideas, instead of just serving as padding for its own sake. I'd rank them as generally equal in execution, but due recognition does need to go (as it so often does) to the longest track, the position of which is filled here by "Gods of Blight", a heavy grinder (with some fierce bass holds) that opens with a goosebump-inducing spoken-word section before the track proper closes the EP. It's also here where the vocals become the most serpent-like, adding a blackened hissing method alongside the throatier delivery, and resulting in what could work well as a signature blending if the band decides to play up the imagery of their name. A very solid start to the band's catalog.